Yesterday, Mondo celebrated one of the most beloved comedies of all time, Ghostbusters, by releasing an epic collection of officially licensed merchandise based on the world’s favorite team of paranormal investigators. Along with a new print and series of pins comes this amazing Stay Puft Marshmallow Man Tiki Mug! The Ghostbusters Stay Puft Marshmallow Man Mondo Tee-kis Mug stands 8” tall, holds approximately 36oz and is made of ceramic. 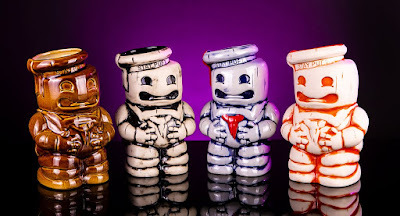 Three versions of the Stay Puft Marshamllow Man went on sale yesterday at the Mondo online store. The Standard Edition ($50) features blue-wiped glaze with red spot decorations, the Bone Variant ($55) features black-wiped glaze and is limited to 650 pieces, and the Crossing the Streams Variant ($75) features orange-wiped glaze and is limited to 200 pieces. There will also be a fourth colorway, a Brown Glaze, which will be available exclusively at select Alamo Drafthouse theater locations very soon.